Bring the racing excitement home! When your barstools need a stylish upgrade, turn to PitStop Furniture Crew Chief Bar Chairs. As with the entire high-quality PitStop line, the PitStop Furniture Crew Chief Bar Chair offers a classy way to proclaim your enthusiasm for motorsports, all while providing function and utility. The PitStop Furniture Crew Chief Bar Chair is ideal for use at countertops, with the PitStop Crew Chief Bar Table, or any other area that requires a tall seating option. 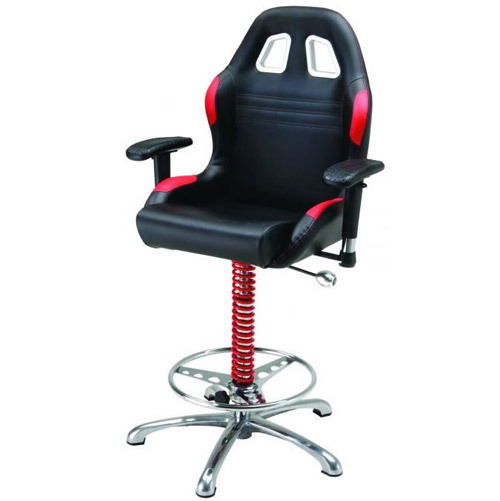 The PitStop Furniture Crew Chief Bar Chair features the styling of a Grand Prix racecar�s bucket seat paired with the practicality of a bar-height stool. For optimal comfort, the PitStop Furniture Crew Chief Bar Chair features padded, tire tread embossed armrests that are adjustable to three height options. 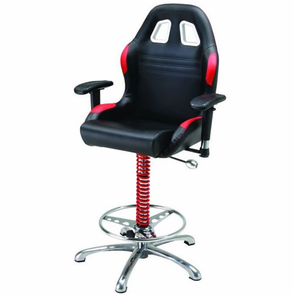 For stability, the PitStop Furniture Crew Chief Bar Chair has a 26� wide track aluminum alloy base accented by a steering wheel footrest and a racing suspension spring. Durable leatherette assures easy cleaning and maintenance for years to come. PitStop Furniture Crew Chief Bar Chairs are designed and assembled in the USA from the highest quality materials available. PitStop Products are backed by an Intro-Tech Automotive, Inc. lifetime warranty. The quality in craftsmanship is evident in each piece of PitStop furniture.